In celebration of the recent release of Kid Icarus: Uprising, Nintendo has gone ahead and created a 3D Classics version of the original Kid Icarus game. While the game has been given away as a preorder incentive with Kid Icarus: Uprising, it has also found its way onto the eShop. As has been proven by their current track record, developer Arika has done an incredible job recreating the game to feel exactly as it should. 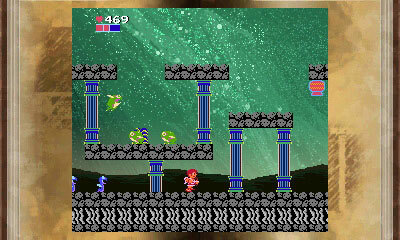 New to this version are actual backgrounds, whereas the original Kid Icarus simply had solid colored backgrounds similar to the original Super Mario Brothers. These backgrounds are mostly awful, clashing with the game’s 8-bit look and at the same time change the mood of the game. The detailed backdrops would feel more at home on a 16-bit game. That said, the single screen tiled backdrops look great and oddly enough look like something that may have been there in the original game. The colorful backdrops also go against the mostly stark black backgrounds of the original, and as a result sprites begin to get lost. When playing in 3D this isn’t much of an issue, but the moment the slider is turned down, characters and enemies begin to get lost in the noise. On topic of 3D, like Resident Evil: Revelations, there is also the option to further adjust the 3D depth in the game’s menus, along with the slider. I had no issues cranking both the slider and depth all the way up. Another change is the Custom Control setting that can be chosen after creating a new file. Custom Control is an attempt to make playing the game a bit easier. Pit seems a bit quicker, the momentum based jumping has been removed, he has the ability to fire arrows rapidly by holding down the fire button, and he can descend from falls slower. Purists can of course stick to the original NES style control scheme if they chose. I played through the entire game on Custom control and noticed the changes, but wasn’t sure if they really made the game easier for me since I’m very familiar with it as it is. New backgrounds and alternate control aside, this is the same Kid Icarus we’ve always known, for better or worse. I personally love it, but I understand there is some nostalgia talking here, and the game is so burned into my brain that I don’t have the issues most new Kid Icarus players have. That said, I know what the issues are. This is the same game that starts out grueling difficult and progressively gets easier. Pit is simply gimped out of the gate, but by the time players make it halfway through the adventure, he’s almost overpowered with upgrades. This is one of the very few games where the first stage of the game is harder than the final stage (which is a cake walk, by the way). 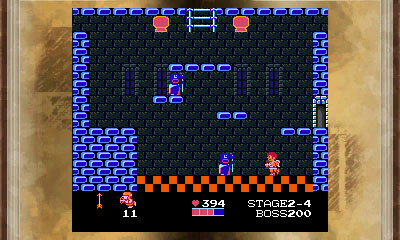 I still think Kid Icarus has some of the best platforming bits that the NES has seen. One thing long time Kid Icarus fans should take note of with this version is that it’s actually based on the Famicom Disk System original. The Disk System version features higher quality music and sound. Instead of the Reaper’s bleeps and bloops upon spotting Pit, he now screams for help. Perhaps the biggest difference is that the game no longer features a Password system, instead it has three save files. On that same token though, it means that classic passwords like “ICARUS FIGHTS MEDUSA ANGELS” no longer work. As a preorder incentive, this is a great giveaway. As a long time fan I enjoyed finally playing a legit version of the Famicom Disk game, and some of the 3D scenes looked good. The real question that remains however, is this worth checking out on the eShop? Unfortunately, no. The alternate controls are interesting, but I wonder how much they’ll actually help new comers as it’s still a gruelingly difficult game. The new backgrounds do more damage than good, and it costs slightly more than the NES version that has been available on Wii for years now. Only big fans of Kid Icarus need apply. When I first wrote this review, I was in the belief that this game was only available to people that preordered and that it was not on the eShop. Then I saw that Gamestop was selling download codes for it. Apparently you can’t buy it, so it is still not available on the eShop as of this writing. 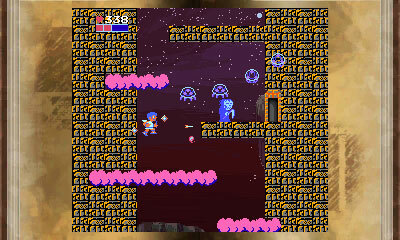 As stated in the review, I love Kid Icarus. The low score is a result of a better version of this being available elsewhere. Some of the new features actually end up hurting the game. The few die hard Kid Icarus fans that exist will love being able to play the Famicom Disk version, which would probably notch this up to a “Worth Buying” for that crowd.